I am in my final days as Lead Pastor of Church of God of Exeter. As I look back upon 14 years of full-time ministry at the local church, I am so thankful for the opportunity to have served in my hometown. There have been incredibly amazing moments along the journey and unimaginably difficult times too. 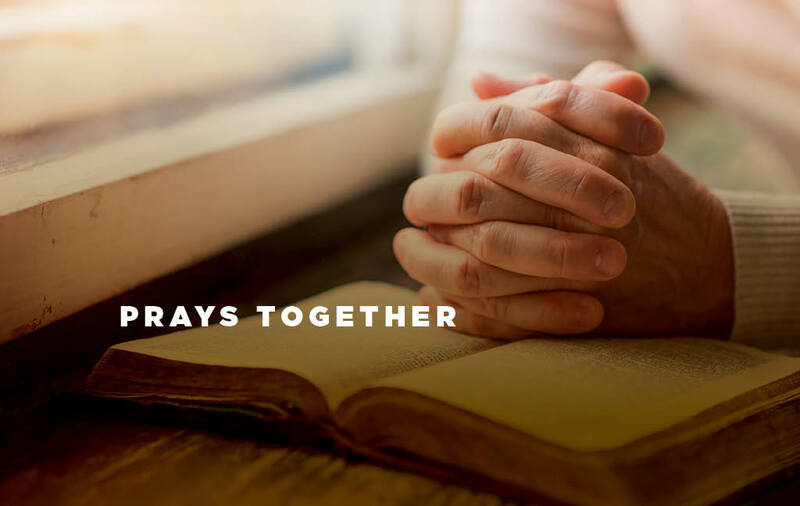 This will be my farewell article for the Prays Together column. It has been an honor to share my reflections over the last five years in collaboration with my fellow pastor friends. Thanks for indulging this one last collection of thoughts. I didn’t grow up in a Christian home, but the house was full of love. We attended Catholic church on many Christmases and Easters, but little to none of it transferred into our day-to-day lives. I was taught good values and ethics, but we were largely deistic in practice. God was out there (somewhere), but He wasn’t involved with daily operations. It was still a loving and warm home. As I reflect on my earliest memories in church, I can see an awe and a reverence in my heart and mind. I had no trouble imagining a God over all creation- how else could all of this life and beauty around us have happened? I remember the singing and the prayers, but the passing of the peace was my favorite moment. “Peace be with you,” one would say across the pews. In return would come, “And with you.” It was a beautiful and real encounter. As I grew older my best friend, Travis, attended Church of God of Exeter with his family. I would stay the night at his house on many Saturdays. If you woke up on Sundays at the Crawford home, not only did you get Jiffy blueberry muffins for breakfast, but you would be driven to church. The services didn’t include Latin and the songs were played with different instruments than I had experienced, but the same God beckoned me to draw closer to him during worship. I would come to the altar, was invited to partake in communion and received prayer through the laying on of hands. I was baptized into the family and continued attending through most of my high school career. It was an amazing and tangible upbringing. Fast forward to the early 2000s. I was standing resolute in my faith after years of spiritual struggle in my college years. My life was in the hands of Jesus. My marriage was founded upon the truths of the Bible. And God was calling me into ministry. I became the Youth Pastor at Church of God of Exeter and pictured myself drinking a lot of coffee at Wildflower Cafe as I counseled people and studied the Bible. I did drink coffee, counsel and study the Bible, but the realities of full-time ministry were very different than my daydreams. Marriages were really falling apart and students were desperately cutting themselves to express their inner pain. It was wonderful and rewarding, but it was also a heartbreaking and gritty calling. Five years of Youth Ministry transitioned into two years of Associate Ministry, which rolled into seven years of Lead Pastor Ministry. I have beheld many people beginning a relationship with Jesus. I have watched people miraculously healed. I have witnessed families transformed. I have seen demons cast out of people. I have uncovered Kingdom dreams, hidden in the hearts of friends, watching them become ministry realities that impact countless others. I have witnessed a church arise to the call to be Good News to their city – becoming God’s family for the sake of revival in Exeter. It has been a magnificent and humbling experience. As I step down from the Lead Pastor role, I will be making Church of God of Exeter my home church as Regional Pastor of Church of God of Central California chogcentralcal.org. My family and I will continue living in Exeter. I will take on a fulltime job in the secular marketplace that will allow me to focus my ministry attention at the regional level. We sense the hand of God on this new chapter of life. It is a very exciting and hopeful season. A few nights ago, Kimberly and I drove to the top of Rocky Hill and parked. We could see the lights of our little town nestled across the valley floor. We prayed over the city and thanked God for the opportunities He has given us over the last fourteen years. It was a serious and sacred moment. We blessed the city and asked for all that the Father has stored in His heart to be released over Exeter. May Exeter have a blessed and rich future.